Shop online for over 200 blair-line model trains at discounts up to 22%. Railroad Scenery is the most popular of the 5 blair-line model trains categories, then Buildings, and Roadway. This is the Z Scale Laser-Cut Shotgun House (3/4 x 2-1/8 1.8 x 5.3cm) from Blair Line. This is the HO Scale Highway Signs - Construction 1950s-Present (black, orange) from Blair Line. This is the HO Scale Laser-Cut Curved 2-Lane Wood Grade Crossing pkg(2) - 18'' Radius from Blair Line. 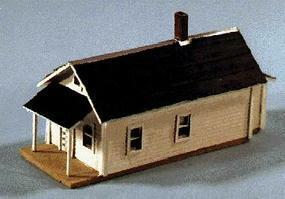 This is the N Scale Company House (2-1/4 x 1-1/2'' 5.6 x 3.75cm) from Blair Line. This is the N Scale Sunset Motel Kit from Blair Line. This is the HO Scale Curved 2-Lane Wood Grade Crossing - Kit - pkg(2) 22'' Radius from Blair Line. This is the HO Scale Sam's Roadhouse w/Outhouse - Kit - Main Building (2-13/16 x 4-1/2'' 7.1 x 11.4cm) from Blair Line. This is the HO Scale One Lane Wood Grade Crossing - Kit - pkg(2) from Blair Line. This is the Laser-Cut Wood Billboard Kits - Large for HO, S & O - Do-It-Yourself Custom (4-3/4 x 2'') from Blair Line. This is the N Scale Shotgun House Laser-Cut Wood Kit (1 x 3'' 2.5 x 7.5cm) from Blair Line.